I knew that this Christmas carol was the earliest "American" carol, having been written in what is now Canada in the 1600's. What I didn't know before looking it up was that the English words above were written in the 1920's and have little to do with the original text besides describing the Christmas story. 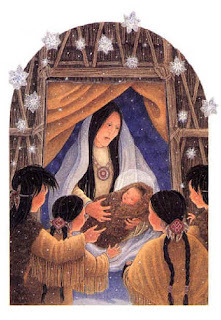 The modern English version puts the setting in something like Hiawatha's Indian village with braves and birch bark, whereas the original was the author's sincere attempt to explain the Biblical account of Christ's birth and its spiritual significance. If you want to see a more faithful, if less poetic translation, click here. As you saw in the last post with videos, Elizabeth has been working hard at learning how to Put Things Into Other Things. She's especially interested in the stacking cups and the sorting shapes cube and will spend vast stretches of time working on fitting her toys together. One day, I was getting kind of bored with watching her do that, so I showed her how the cups can stack up and make a tower. This was incredibly exciting to Elizabeth, who started making happy exclaiming noises as if to say, "Wow! That's so cool! How come I've never seen anything that amazing before?!" She was quickly frustrated, however, by the fact that every time she tried to pick up the tower, it simply fell over. While she was angrily trying to pick up the pieces and make them all go back together, only in her lap this time, she picked up the littlest yellow cup. If you look at the pictures, you will see that the littlest cup doesn't really belong with this set. It's hexagonal rather than round, and a slightly different color, and though you can stuff it into the green cup, it sort of goes halfway and sticks there. Up 'till now, Elizabeth has been treating the green and yellow cups as a unit to be stuffed into other cups. When I was building the tower though, I pulled the yellow one out, and put it on top of the green. When Elizabeth knocked the tower down, she was able to pick up the yellow cup and really look at it. I could see on her face that she could tell that something was different about this cup. I could almost hear the song, "One Of These Things Is Not Like The Others," playing in the background. She looked at it, twisted it, tasted it, then crawled over to the sorting shapes cube, and shoved it in one of the holes! Yes, that's right. She figured that it looked a lot more like the sorting shapes than the stacking cups (which it does, it's even about the right size), she decided it ought to be with the other sorting shapes, she found the cube, and managed to get it into one of the holes on her first try (which she can't always do with the sorting shapes themselves because they have a tighter fit). I think this is an amazing leap of logic for a baby who's not yet a year old, and I'm terribly proud of her. Elizabeth thinks, and rightly so, that the Christmas tree is awe inspiringly pretty and sparkly and wonderful. She has learned the sign for Light (her third after Hi and Book), and uses it for both lights, and other pretty things that she wants to have -- both of which refer to the Christmas Tree. She also makes the sign at the Jingle Bell wreath on the front door that she loves to jingle each time we go in or out, the dining room chandelier, and the little doll in the Strawberry Shortcake music box. Still, no matter how much she wants the tree and the things on it, she is very careful when she reaches out to touch it. For instance, many times, she'll just tap the ornament with her fingers and watch it swing. When she does grab, if the hook or string catches, and it's not easy to get off, she'll try a different one rather than just pulling harder. Her favorite ornament, the one she goes for first, and most often, is the Golden Snitch, which is actually a pencil sharpener, but which always looked like it belonged on a Christmas tree to me. She also likes the various jingle bell ornaments, and the candy-tin ornaments that she can pull apart and fit back together again (both of which are visible in the bhoto below). Yesterday, while playing with the biggest jingle bell, she tried to put it back on the tree. She seemed disappointed when it slid through the branches and fell on the floor, and pleased when I picked it up and hung it correctly. We played that game a few more times, then she picked up another ornament that was on the floor, this time a gold snowflake. She managed to get this one to stay on the tree by laying it flat on a couple of branches, but again seemed disappointed. It took me a moment to see that she didn't like the way it sat still on the branch instead of hanging up by the string so it could sway and twirl. She was very happy when I hung it, and the other ornaments she handed me, the right way. Not only is my baby clever, she has an eye for aesthetics. This picture from October shows the cute little bluebird shoes I made for Elizabeth. Because it was so cold today (Yes, I know, you'd all love to get a nice warm day in the high 50's and low 60's but everything is relative), I thought Elizabeth ought to have a sweater and shoes for our weekly visit to the park. I put on the pink sweater Mom knitted (the one with flower buttons and embellishments), and the bluebird shoes. Elizabeth has worn those shoes before without any problem, but today, she just freaked out. She didn't want them on her feet. When I got them on and tried to stand her up, she wouldn't let her feet touch the ground, she was just one unhappy girl. I was pretty sure she'd get over it if I distracted her, so I tried showing her the big teddy bear that always makes her smile. She would have none of it, and shoved the bear away. Then she started pulling on the sweater, trying to get it off. I'd seen her do this move a few times before when she was hot, so I obliged by taking off the sweater. She looked at me as if to say, "OK. You do understand the concept of take-it-off so now, get rid of these shoes!" and she started yanking on the shoes again. She worked so hard at communicating that I didn't have the heart to make her leave them on, so I took them off. Once that was taken care of, she let me put the sweater back on (it was never a problem in the first place) and even let me choose a different pair of shoes, which she wore without complaint for several hours. This may have been the first battle over what she's willing to wear, but with a little girl as strong willed as this one, it certainly won't be the last. Well that's all for today. Next time, I'll post our Christmas letter and photo since the ones I sent through the mail should have started arriving by now. Maybe she was concerned about the birds getting squished and didn't want to step on them. I am so proud of Elizabeth, she is growing so fast. It is so neat to see them reach those milestones!! I think maybe Elizabeth is a genius. Really? What age did you teach? We have a Christmas Carol book with another translation set to music, but it's just one verse. I looked up a few other versions of the Huron Carol, and found one (http://home.golden.net/~wts/words/otherwords/wts-thehuroncarol.html#Hegarty) that was a little more faithful to the literal translation. But it still wasn't as close as I thought it could be, so I adapted it using one (http://www.wyandot.org/carol.htm) other literal translation to help me. Here's the finished product with my changes marked by brackets. And here's (http://www.cyberhymnal.org/mid/j/e/s/Jesous_ahatonhia.mid) a midi of the tune, though it's a little different from the version I used to guide my refrain's meter. his bonds are all undone. [That led them on before. Not far from where he lay. And whispered, "Come this way." To bless the King of Kings. His wealth with us will share.